Find all the best Shopmium deals, discounts, freebies, voucher codes and more here on LD. Shopmium is a startup founded by Eli Curetti, Quentin de Chivre and Philippe Cantet. It changes the way how products are discovered as well as the relationship between a brand and its customers. The company has a mobile app which provides users the power to discover offers in their nearby stores. Using it is very simple, all they have to do is to take a picture of their receipt and they will get a cash back on their purchases. To date, Shopmium has more than 2 million customers who have already downloaded their mobile app. In 2015, they joined the US based group Quotient Technology Inc., which is one of the world’s leading digital promotion and media platform that connects, brands, retailers and consumers. They distribute digital coupons and media through a wide range of products which includes digital printable coupons, digital paperless coupons, coupon codes, and card linked offers. Here at Latest Deals, you will find only the best and the latest sales, discount codes, deals and coupon codes for Shopmium shared exclusively each month for our members by our massive community of bargain hunters who are always on the hunt to find the best possible value for your money! Get exclusive offers in your local stores and great discounts! Save money with great deals and try products at reduced prices. Daily discounts and freebies on food, beverages, grocery, cosmetics and more! Browse their selection of offers and pick the ones that interest you. Buy the products in your usual stores. Send them a picture of your receipt. Get your cash back directly into your bank or PayPal account. How do I claim a caschback? Simply buy an eligible product at any store (unless the terms and conditions state otherwise! ), scan the barcode and take a picture of the receipt. You can choose to receive cashback to your PayPal or bank account. You must submit a request for each cashback claim, even if they are on the same receipt. Cashing out is automatic on Shopmium hence there is no cash out option. Cashback payments are sent directly to your PayPal or Bank account immediately after your claim has been approved. PayPal payments appear in your account within 24 hours and bank payments within 72 hours (business hours). How do I contact Shopmium? For general enquiries, you may read their full FAQ section. For other questions, you may contact their customer service by using their Online Contact Form. What are the delivery options for Shopmium? They do not offer any delivery or shipping option, you have to claim the products on your Shopping List on the participating stores. What is a Shopping List? The Shopping List feature allows you to add your favourite offers to a virtual basket so that you can easily find them when you’re shopping in store or when the time comes to request your cashback. How do I return an item to Shopmium? You have to check with the participating stores where you claimed your items with regards to their Returns policy. Can I reserve my cashback request? Unfortunately no. Adding an offer to your Shopping List does not mean you have priority over other users. If the offer has expired or the cashback have been exhausted, you won’t be able to redeem it from your Shopping List. How long does an offer stay in my Shopping List? The offer will stay in your Shopping List for as long as you want or until 3 days after the offer ends. If the offer has ended but you’ve bought the product during the eligible time period, you still have 3 days to request your cashback straight from your Shopping List. They reward your loyalty to their app by using your referral credits to top up their offers, so that the products you purchase will be free or a lot cheaper until your credits run out. For every friend you refer, you will receive £4 worth of Shopmium referral credits, and your friends will receive a FREE referral offer on their app! 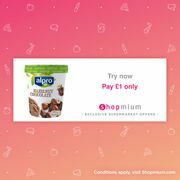 When a friend you have referred successfully claims their first offer, you will earn £4 worth of Shopmium referral credits which will be applied to your future rebates.